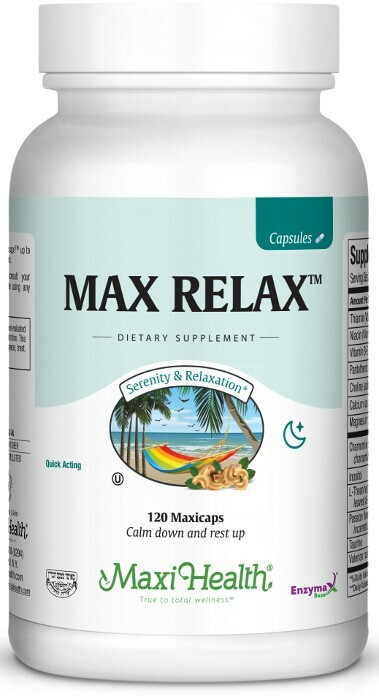 Max Relax™ in convenient capsules are our own proprietary blend of essential amino acids, B vitamins in combination with valerian root and minerals, such as calcium, magnesium and much more. Check out the supplement facts and see for yourself. Get non addictive Max Relax Capsules™. Take two (2) capsules daily before meals, or as directed. Other Ingredients: Vegetable cellulose, magnesium stearate, Enzymax™ (calcium carbonate, bromelain, papain, lipases, amylase, protease, silica), and microcrystalline cellulose. This product contains NO animal products, soy, gluten, wheat, sale, sugar, milk, yeast, artificial preservaties, flavors or colorings.